This is an old revision of this page, as edited by 98.232.92.30 (talk) at 11:43, 19 April 2011 (→‎Infrastructure). The present address (URL) is a permanent link to this revision, which may differ significantly from the current revision. This article is about the city in the Philippines. For the province in the Philippines, see Cebu. The City of Cebu (Cebuano: Dakbayan sa Sugbo) is the capital city of Cebu and the second city in the Philippines, the second most significant metropolitan centre in the Philippines and known as the oldest city established by the Spaniards in the country. The city is located on the eastern shore of Cebu and was the first Spanish settlement in the Philippines. Cebu is the Philippines' main domestic shipping port and is home to about 80% of the country's domestic shipping companies. Cebu also holds the second largest international flights in the Philippines and is a significant centre of commerce, trade and industry in the Visayas and Mindanao region. According to the 2007 Philippine census, the city has a population of about 798,809 people. Cebu City is the centre of a metropolitan area called Metro Cebu, which includes the cities of Mandaue, Lapu-Lapu and Talisay. Metro Cebu has a total population of about 2 million people. 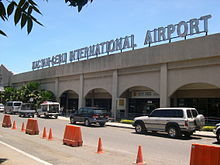 The Mactan-Cebu International Airport, located in Lapu-Lapu City is only a twenty-minute drive away from Cebu City. To the northeast of the city are Mandaue City and the town of Consolacion, to the west are Toledo City, the towns of Balamban and Asturias, to the south are Talisay City and the town of Minglanilla. Across Mactan Strait to the east is Mactan Island where Lapu-Lapu City and an aquarium attraction are located. A 19th-century map of Cebu City. Magellan's Cross Kiosk in the 1900s. On April 7, 1521, Portuguese explorer Ferdinand Magellan landed in Cebu. He was welcomed by Rajah Humabon, the king of Cebu, who together with his wife and about 700 native islanders, were converted into Catholicism on April 14, 1521. Magellan, however, failed to successfully claim the island for the crown of Spain, having been killed by Lapu-Lapu, a king in Mactan Island on April 27, 1521 in the Battle of Mactan. On April 27, 1565, Spain colonized the area with the arrival of Spanish explorers led by Miguel López de Legazpi, together with Augustinian friar Andrés de Urdaneta, sailing from Mexico, arrived in Cebu. The Spaniards established settlements, trade flourished and renamed the city on January 1, 1571, from San Miguel (Saint Michael) to Villa del Santísimo Nombre de Jesús (Village of the Most Holy Name of Jesus). During this six year period of exploration and settlements by the Spaniards, Cebu City was the capital of the Spanish East Indies. In 1898, the city was ceded to the United States after the Spanish-American War and Philippine-American War. In 1901, the city was governed by the United States for a brief period, however it attained the status of a charter city in 1936 and was governed independently by Filipino politicians. Following the end of the Japanese occupation in World War II, the city gained independence from colonial rule in 1946 as part of the Republic of the Philippines. Procession during the Feast Day of the Santo Niño. When the Spaniards arrived in Cebu, the Italian chronicler, Antonio Pigafetta, sailing under convoy with the Magellan expedition, offered a baptismal gift to Hara Amihan, wife of Rajah Humabon. She was later named Juana, the figure of the Santo Niño. The natives also honored the Santo Niño de Cebu in their indigenous Sinulog ritual. The Sinulog ritual was preserved but limited to honoring the Santo Niño. Once the Santo Niño church was built in the 16th century, the Christian Malay people started performing the Sinulog ritual in front of the church, the devotees offering candles and indigenous dancers shouting "Viva Pit Señor!" (Hail Mister). In the 1980s and 2000s, the city authorities of Cebu added the religious feast of Santo Niño de Cebú during the Sinulog Festival to its cultural event. Cebu City is an independent and chartered city. Registered voters of the city cannot vote for provincial candidates unlike its nearby counterparts (Mandaue and Talisay cities) that form part of Metro Cebu. It is the capital of the province mainly because the provincial capitol is located in it. There were proposals however during the time of Governor Emilio Mario Osmeña to establish an "administrative district" that would be independent from Cebu City. This would literally mean carving out Cebu City's Barangay Capitol where the provincial capitol and other provincial offices are located. The plan however didn't push through and was even followed by other proposals like the transfer of the capital to Balamban. Cebu City is governed mainly by a city hall, composed of one mayor, one vice-mayor and sixteen councilors (eight representing the northern and eight representing the southern region). Each official is elected publicly to a three year term. The chief of the Association of Barangay Captains and the President of the Sangguniang Kabataan Federation also managed in the city council. The day to day administration of the city is handled by a city administrator. Michael Rama is the mayor of the city. The former vice mayor was elected during the 2010 Philippine elections, meanwhile Joy-Augustus G. Young is the vice mayor. Cebu City is considered as one of the most progressive cities in the Philippines. About 80 percent of the island vessels operating in the country are also based there. Recently, the entry of business process outsourcing (BPO) firms such as call centres have contributed much to the growth of the local economy. BPO sites are scattered throughout the city. During the last years of the 1980s, growth has been spread to the countryside. Thus the name Queen City of the south. Aside from shellcrafts, rattan furnitures and stonecraft, tourism may well rake in dollars. Cebu City has a land area of 291.2 square kilometres and about 55.9 square kilometres is classified as urban, while 235.2 square kilometres is classified as rural, although all barangays are classified as urban. To the northeast of the city are Mandaue City and the town of Consolacion, to the west are Toledo City, the towns of Balamban and Asturias, to the south are Talisay City and the town of Minglanilla. Across Mactan Strait to the east is Mactan Island where Lapu-Lapu City is located. Further east across the Cebu Strait is the Island of Bohol. Around 1960's the population of the city was just around 91,000. The current data shows that the population reached 799,762 people in 2007. The city is politically subdivided into 80 barangays or barrios. These are grouped into two congressional districts, with 46 barangays or barrios in the northern district and 34 barangays or barrios in the southern district. Cebu City is politically subdivided into 80 barangays. The city is readily accessible by air via the Mactan-Cebu International Airport located in Lapu-Lapu City which has direct international flights to Hong Kong, Singapore, Japan, China, Qatar, South Korea and domestic destinations. Many international and cargo airlines fly to Cebu. There are also direct transfer flights via the capital's Ninoy Aquino International Airport that readily connects the city to other destinations in the world. The city mostly gets its power from an interconnection grid with the Leyte Geothermal Power Plant which also powers the majority of the Visayas Islands. There are also coal-fired power plants, though these have been controversial due to their environmental impact. Another coal-fired power plant is nearing completion and is envisioned to make the city independent from the interconnection grid once completed. The city is served by a domestic and international port which are handled by the Cebu Port Authority. Much of the city's waterfront is actually occupied by the port with around 3.5 kilometres of berthing space. The city is home to more than 80% of the country's island vessels traveling on domestic routes mostly in the Visayas and Mindanao. The South Road Properties (SRP) is a 300-hectare prime property development project on a reclaimed land located a few metres off the coast of Cebu's central business district. It is registered with the Philippine Economic Zone Authority (PEZA) and is funded by the Japan Bank for International Cooperation(JBIC). Traversing the property is a 12 kilometres, four-lane highway known as the Cebu Coastal Road that provides the motorists with a good view of Cebu's south coast and the nearby island of Bohol. Telecommunication facilities, broadband and wireless internet connections are available and are provided by some of the country's largest telecommunication companies. In the 1990s the Inayawan Sanitary Landfill was constructed to ease garbage disposal within the city. It is however nearing its lifespan although the Provincial Government is planning to build two sanitary landfills to serve both the northern and southern parts of Metro Cebu including Cebu City. In June 2005, the city fully implemented the segregation of wastes as mandated by law. Mass transportation throughout the city and the metropolitan itself is provided by jeepneys, buses and taxis. There were previous plans of setting up a mass railway system but it was deemed not feasible as of the moment due to the high construction cost that it will entail and the uncertainty of making the routes profitable. University of San Carlos in Cebu City. University of San José Recoletos in Cebu City. Cebu Normal University in Osmeña Boulevard. Cebu City is one of three centres of education in the country, the others being Metro Manila and Davao City. It currently has nine large universities each with a number of college branches throughout the city and more than a dozen other schools specializing in various courses such as Medicine, Accountancy, Engineering, Nautical courses, Nursing, Law, Computer and IT and among others. Among these schools is the oldest educational institution in the Philippines, the University of San Carlos. It has four campuses around the metropolitan area. Before gaining university status, it was originally called Colegio de San Ildefonso and was established in 1595 by the Jesuits. It is currently headed by the Society of the Divine Word. The University of the Philippines Visayas - Cebu College, located at Barangay Camputhaw in the district of Lahug in Cebu City currently has 8 courses and has plans of expansion and development. Another catholic university in Cebu City is the University of San José - Recoletos which was established in 1947. It is currently headed by the Augustinian Recollects and has 2 different campuses within the city excluding a new campus outside the city located in the Municipality of Balamban. Cebu Normal University was established in 1915 as a provincial normal school, a branch of the Philippine Normal School. It became an independent institution in 1924, a chartered college in 1976 and a university in 1998. It is one of the oldest educational institutions in Cebu City. One of the newest universities, the Cebu Doctors' University (formerly Cebu Doctors' College) was granted university status on November 2004. It is the only school in the Philippines declared as a university without having basic education (pre-school - high school) curriculum and catering mainly to courses related to the health services field. It has just recently relocated to a nine-storey main building at the Cebu Boardwalk in neighboring Mandaue City thus closing its old campus near the then Cebu Doctors' Hospital (now Cebu Doctors' University Hospital). The Cebu Institute of Medicine (Velez College) is one of the five recognized Centers of Excellence in the Philippines, and recently adopted the Problem Based Learning (PBL) Method. Its over-all passing percentage in the Philippine Medical Board Examination is 95.37% from 1994–1998 and 100% in the August 2007 Examination. The University of Cebu in Banilad opened in June 2002, first had an eight-storey building. With the projected increase in enrollment in school year 2004-2005, a nine-storey building was constructed in the same area. The University of Cebu's main campus offers courses such as Bachelor of Science in Information Technology (BSIT), HRM, Computer Engineering, BSED and others. Also located in the city is the University of the Visayas (the first-ever university in the city and in the entire province). Other noteworthy institutions in the city includes Southwestern University, the Cebu Institute of Technology – University (the newest university in the city), the University of Southern Philippines Foundation in Lahug and Mabini, and the Cebu Technological University (formerly the Cebu State College of Science and Technology). Many foreign students also travel to Cebu City to study. Most of them are Iranians and Nepalese who are studying medical courses. In recent years, many Koreans have come to Cebu to study English. Cebu City has 68 public elementary schools, 23 national high schools and 28 night high schools. These night high schools are operated by the city government. Waterfront Cebu City Hotel, site of the 1998 ASEAN Tourism Forum. The city derives significant income from tourism. It hosted the 1998 ASEAN Tourism Forum. The city also hosted the East Asian Tourism Forum on August 2002, in which the province of Cebu is a member and signatory. There are a number of significant Spanish colonial buildings in Cebu City, including the Basilica Minore del Santo Nino, Fort San Pedro, Casa Gorordo Museum and Magellan's Cross. There are a number of shopping centres in the city. Away from the city is the Cebu Taoist Temple, a Buddhist temple in Beverly Hills. The Taoist Temple gives a commanding view of Cebu City and the nearby cities of Mandaue and Lapu-Lapu. Views of Cebu City can also be seen from villages and gated communities located on the mountains. The beauty of Cebu Philippines Temple of The Church of Jesus Christ of Latter-day Saints in Lahug marks the second of its kind in the Philippines after Manila Philippines Temple. Cebu Philippines Temple serves Latter Day Saints from the island of Masbate, whole Visayas and Mindanao. The Cebu Reggae Festival is a popular Filipino Reggae and Roots music festival, it now has become one of the Philippines' largest annual Reggae Festivals, in Cebu City. The city also has a sport institution, the Cebu City Sports Complex which exhibits sporting and festival events. ^ "Davide is acting Cebu City mayor Osmeña in US, Rama off to Korea". INQUIRER.net. Retrieved 10 October 2008. ^ "Osmeñas leave for US amid prayer". INQUIRER.net. Retrieved 8 October 2008. ^ Department of Tourism Philippines official website page on Cebu. Accessed 28 September 2009.